If you ever had doubts about how big mobile internet is going to be, check out this presentation by Morgan Stanley’s Mary Meeker. It’s one of those presentations that you just want to tell everyone about. Mobile internet is bigger than you think. iPhone is becoming THE mobile platform. 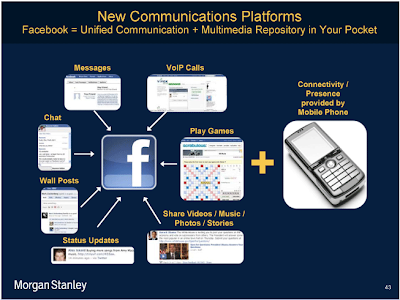 Social media, mobile devices are changing communications and commerce. Mobile internet trends in Japan show how the future will be. Carriers will be crushed by demand. Mary Meeker emphasized how Facebook has been the “largest share gainer of online usage over the past 3 years” and is now serving as the new communications platform for a large percentage of internet users while Twitter is gaining some ground. What is driving the phenomena growth is mobile and the attention is shifting in a big way to mobile devices. To highlight this shift, Meeker referenced Mixi, Japan’s largest social network. Mixi has seen desktop usage shrink and mobile usage explode as overall usage across the site increased since 2006. Facebook has also experienced tremendous mobile growth over the past year with over 65 million mobile users according to the company. This trend is expected to continue and if the U.S. mimics Japan’s trends, we’ll most likely see Facebook usage shift from desktop to mobile. In short, mobile will be BIG. Be prepared for the evolution. Check out below the video summary of Mary's presentation via The Business Insider.